Originally published in the mid 1970s, Dave Line's first book is a comprehensive guide to the theory and practice of brewing beer at home. Thorough discussions on topics such as water treatment, yeast action, brewing processes and bottling/barrelling practices are accompanied by a full explanation of the various types of malts, sugars, adjuncts and hops and the effects each have on the overall flavour, colour and strength of your finished brew. 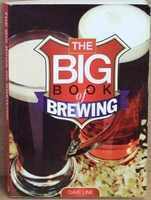 A selection of beer recipes concludes the book to allow you to put the theory into practice and experience how easy it is to predict (and adjust) the finished product to suit your personal taste once you know how and WHY the brewing process operates. Dave's follow up book, "Brewing Beers Like Those You Buy" shows how commercial brewers used these same principles to create their brews and includes over 100 recipes showing how you can recreate some of the best known (and some now sadly departed) real ales, lagers, milds, brown ales and stouts that the brewers art has produced over the last 50 years.